Don't tell these prehistoric pals how cute they are—they have a reputation to uphold. If these planters were to scale, you'd have to plant a redwood tree in Steggy (what? It's a nickname. We're a little attached). 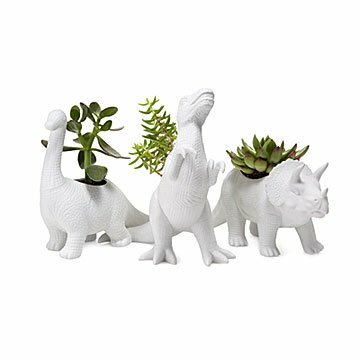 These dinosaur planters make an adorable accent on your windowsill, by your bed, or on the coffee table. Just don't tell T-Rex that he's adorable—he has a reputation to uphold. The playful, prehistoric designs are made from sturdy porcelain, and work best with succulents, Calla Lillies, or other house plants that don't need drainage. Send one to your favorite green thumb or friend who wishes they were a paleontologist. Made in China. This was a great gift! As it was a gift, can't say more about it than he loved it. I didn't see it - had it wrapped and shipped. I love how sturdy this planter is, and it's the perfect size for a window or on a side table. I love that you could switch out small plants seasonally. It's even nicer than I expected based on the picture online. My father loved these planters. He bought himself the T. rex so I bought him the triceratops and now he has a little dinosaur scene in his office.